Maria Lindsey has secrets to hide. Living on top of a secluded mountain is a good way to hide from the world… until her past begins to track her down. The surprising and intriguing new novel about the astounding secrets we keep from those we love. Maria knew about guilt. It was a stubborn, pervasive and toxic emotion, and incredibly difficult to shake. Especially if really, deep down, you didn’t think you deserved to let it go. Maria Lindsey is content. She spends her solitary days tending her bees and creating delicious honey products to fund orphaned children. A former nun, her life at Honeybee Haven has long been shaped by her self-imposed penance for terrible past events. But the arrival of two letters heralds the shattering of Maria’s peaceful existence. Pushing aside the misgivings of her family and friends, Tansy Butterfield, on the eve of her marriage, made a serious deal with her adored husband, Dougal. A deal she’d intended to honour. But, seven years on, Tansy is finding her current feelings difficult to ignore. And on top of those not-really-there feelings, Dougal wants to move to Canada! I first heard about The Beekeeper’s Secret from Deborah over at the Debbish blog. Her review catapulted me into wanting to read it. Not long after I was down at our local bookshop to buy it and I must say there are no regrets! Australian author Josephine Moon has written a wonderful book that touched me on many levels. It is set on the Sunshine coast of Queensland and it was evocative of all that is beautiful there. While I have only visited for a short few days, this book brought it all back to me. The flora and fauna, the coast. It breathes Australia. I loved all the characters. They are varied yet all dealing with very human challenges and life events. There are a number of secrets, family not speaking to each other for years, marital disagreement and disappointment. There are some who want to change their path. One aspect of this book (gently related) is about the abuse of certain supposed men of God and the abuse and cover up in the Catholic church. It was really well done, and the aspect of secrecy well explored. While I personally have never come up against this, I know it has gone on in many parts of the world. Not just in the church of course. In the book one character makes a decision about his participation in the church and I liked that. While the wife is very miffed to put it mildly I liked the stand he took. In fact I loved this aspect of the book from the very dedication… For my sister Amanda, who in 1981 was adamant she would wear a lolly-pink dress to her first Holy Communion, rather than a white dress, thereby forever being the pink sheep in the formal group photo. I so love her individual spirit. Maria one of, if not the main character, is a strong and dedicated woman. A nun for many years, she has left her order and she now runs a business that keeps an orphanage in Cambodia running. Throughout the story her past is told – mainly to Tansy her niece, who finds her and wants to reconnect her with the family. And what a story! As I was brought up in the Catholic church I identified with so much in this book and really liked the firm but respectful tone that the author takes in relation to it. It is balanced, positive, yet recognises some of it needs change. Not least in attitude – and to Finlay I say “I salute you”. Such courage of conviction. Bees. I loved all the bee facts, they weren’t boring, they were informative and heartwarming. I already liked them, have lavender planted all about my place for them, but in this story I found them so delightful as well. There final salute had me swallowing hard. I loved Tansy – she was determined to bring her family back together, had challenges to face and was a good friend and step mother. Look – I totally felt for 99% of the characters. You can guess the 1% I didn’t! I could go on and on. I know this book is published in Australia, the UK and NZ, but I am not sure about elsewhere. A pity if its not, it should be. 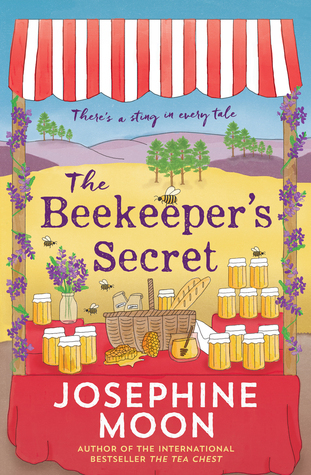 And I highly recommend Deborah’s review of The Beekeeper’s Secret. You were right Deb it is my kinda book.